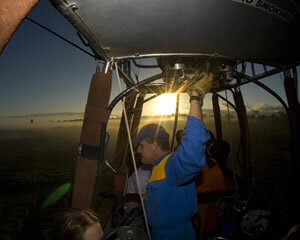 Hot air ballooning is one of the most exciting yet graceful things you will ever do. Get some friends together or a special someone and enjoy a hot air balloon ride. You will float into the sky with an experienced crew and be able to take in the beauty of Australia's landscape while enjoying the hospitality. If you're interested in trying something new, a hot air balloon flight should be on your list! Hot air ballooning is terrific and the memories of a hot air balloon flight will stay with you forever. A hot air balloon ride or hot air ballooning in Canberra, Perth, Alice Springs, Melbourne, Hobart, Brisbane, Sydney, Darwin and many regional locations like Cairns, the Gold Coast and the Hunter Valley is unbeatable and makes a great gift. Let us introduce you to the gentle joy and total freedom of hot air ballooning over the beautiful Avon Valley. Imagine floating as slowly as a cloud and looking at the world below. Afterwards, celebrate with a delicious breakfast. Enjoy the serene spectacle of Melbourne waking gently at sunrise, then transforming into a bustling metropolis of over 3,000,000 people. At the end of each flight we return to the Observatory Café for a delicious breakfast. Enjoy a 60 minute balloon flight beside the West MacDonnell Ranges. Wildlife, particularly red kangaroos, are seen nearly every day as you cross spinifex grasses, mulga scrub and cattle stations. Includes return transfers from your accommodation and a picnic style champagne breakfast. Enjoy a 30 minute balloon flight alongside the West MacDonnell Ranges. Wildlife, particularly red kangaroos are seen nearly every day as your balloon crosses spinifex grasses, mulga scrub and cattle stations. Includes return transfers and a picnic style champagne breakfast. Melbourne is set around the shores of Port Phillip Bay; the perfect backdrop for an early morning flight over Australia's second largest city. Depending on the winds you may fly over the CBD. Or head over the inner suburbs, parks and gardens to discover why Melbourne is labelled the Garden State. A truly unique experience as you float across the sky and over the top of the unique landscapes of the Yarra Valley. Peaceful yet exhilarating, the flight lasts for approximately one hour. Finish the journey with a champagne breakfast - delicious! Need to getaway? Then our package of a hot air balloon ride, overnight accommodation and dinner for 2 is the perfect answer! The flight includes view over the Greater Brisbane region encompassing the heritage city of Ipswich and the Scenic Rim. Experience the romance & wonder of ballooning, enjoy champagne & delicious hot breakfast at O'Reilly's Vineyard. Transfers from Brisbane CBD, Meeting Spots at Fortitude Valley/Mt Gravatt/Browns Plains/Kangaroo Point. Fly over one of Australia's best ballooning spots. Celebrate with someone special. Travel Photography can be fun and when done well captures your memories beautifully forever! This workshop is a practical 8 hour session where you will learn how to make your photographs look great. Your tutor is a talented professional who will teach you plenty of tips and tricks you can use! 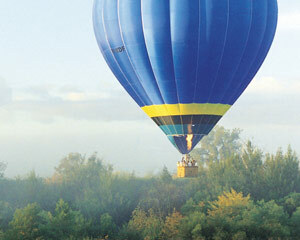 Rise above with WA's oldest & most experienced balloon operator. 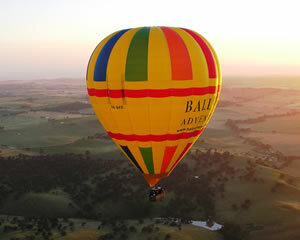 The Avon Valley WA, is the ultimate place to experience the enchantment of a hot air balloon flight. A rural landscape of rolling hills, green fields, & meandering streams provides a picturesque setting for the oldest form of flight. Have you ever wanted to experience ballooning over the Greater Brisbane region and surrounds?Now you can enjoy superb and glorious views whilst floating majestically and effortlessly over the stunning valley's of the Scenic Rim and the heritage city of Ipswich, part of the Greater Brisbane region! Equally thrilling and relaxing, a hot-air ballooning adventure for 2 people is a pure and unforgettable experience especially over the unique city of Canberra. 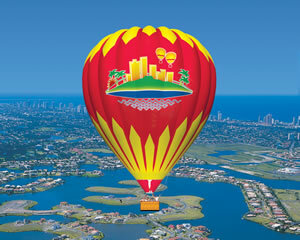 Take to the sky in a hot air balloon over the picturesque Gold Coast hinterland. 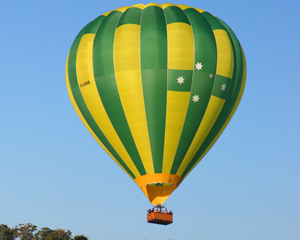 The best Hot Air Ballooning experience in Sydney. Gently float over the parks, gardens and hills of rural Sydney. Spend a magnificent dawn floating over the Belubula Valley near Orange, NSW! 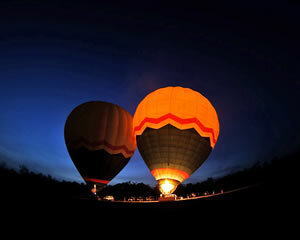 This Hot Air Balloon Flight is an unforgettable experience and memorable gift. Become one with the world as you float through the sky, and return to earth with a luxurious vineyard breakfast. 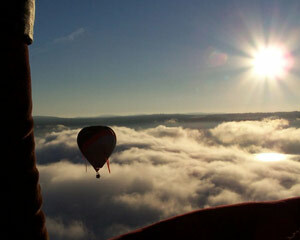 Experience a serene Balloon Flight, drifting over the scenic Belubula Valley near Orange in New South Wales. This Balloon Flight makes a unique and memorable gift for that special person. Hot Air Balloon Rides over Melbourne are a breathtaking way to see the town! Depending on the wind at dawn, your ballooning adventure may take you over the CBD, inner suburbs, parks and gardens, with Port Phillip Bay creating the perfect backdrop as you discover this gorgeous city from the air! Be introduced to the gentle joy and total freedom of hot air ballooning. Imagine floating as slowly as a cloud and looking at the world below. What better way to see the beautiful Avon Valley. Hot air ballooning over the beautiful Yarra Valley, a bottle of Domaine Chandon and a champagne breakfast for two is an experience that should be shared with a very special person. Just the two of you and your pilot in the basket of a hot air balloon...pure magic and romance! A 30 minute hot air balloon flight takes you on a journey alongside the West MacDonnell Ranges. Kangaroos, wallabies and birds can be seen in their natural habitat. Hot air ballooning in Alice Springs is the perfect way to appreciate the vast remoteness and spectacular dawn colours of the outback. This hot air balloon flight begins 1 hour before dawn. You will be picked up by the crew and taken to one of our numerous launch sites. We then determine the best place to launch, and inflate the balloon. We encourage passenger participation to pack up the balloon, but not essential. 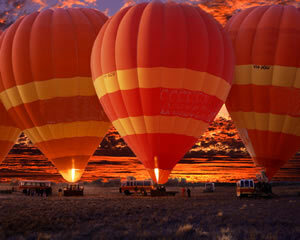 Experience the legend of Australia's Outback in the total freedom of a Hot Air Balloon. Your ballooning adventure begins in the cool pre dawn darkness as you are picked up from your accommodation. Climb into the traditional wicker basket of a Hot Air Balloon and sail the morning skies. 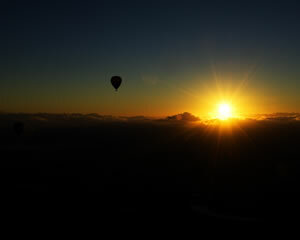 Let us introduce you to the tranquil beauty and total freedom of Hot Air Ballooning. Close your eyes and imagine yourself drifting silently through the air. You feel no wind, because you are the wind. Let us introduce you to the tranquil beauty and total freedom of hot air Ballooning. Close your eyes and imagine yourself drifting silently through the air.